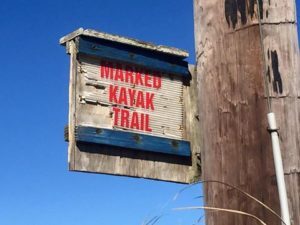 What better way to wind down from a hectic week than getting outside with friends, neighbors & other paddling enthusiasts to enjoy the quiet & serenity Matagorda waterways have to offer? Matagorda Adventure Company is proud to announce we will be hosting a Matagorda Monthly Paddle MeetUp on the second Friday of the month. This event is a free community event open to all. Just bring your kayak, canoe, standup paddleboard or other non-motorized craft, fishing poles & license (if you want to fish), night lights (if you want to stay out past dark), plenty of water, sunscreen & bug spray, and most importantly your friends & family! We will rotate locations every month to explore some of the many paddling sites around Matagorda, Texas. If you don’t have your own boat you can rent one from MAC for $5 off the regular half-day rental rate. Click here to reserve a boat at the discounted rate. Our inaugural paddle will be on Friday, August 12th at 6:30pm at St. Mary’s Slough/Bayou. Be sure to park on West side of Beach Road and not block any driveways. After the paddle join us for a cold beverage at Snapper’s Bar & Grill! Call us with any questions at 832-779-4157 & We’ll see you on the water!